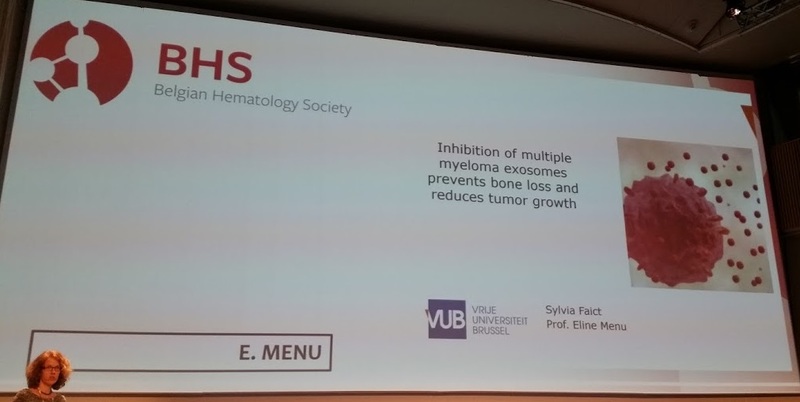 Professor Eline Menu from the research group Hematology and Immunology group presented at the Annual Meeting of the Belgian Hematology Society their latest results on exosomes in Multiple Myeloma. The study conducted by PhD student Sylvia Faict revealed that inhibition of multiple myeloma exosomes prevents bone loss and reduces tumor growth. Multiple myeloma will often manifest osteolytic lesions during disease development. Exosomes are known to play an important tumor-promoting role in the bone marrow micro-environment, by inducing angiogenesis and immune suppression. The aim of our study was to examine the effects of MM exosomes on osteolysis, and to determine whether inhibition of exosome secretion can lead to a delay in tumor growth and prevent bone loss. We used the 5TGM1 model which is a syngeneic murine MM model, presenting typical MM characteristics such as osteolysis, angiogenesis and a serum M-spike. We examined the effects of conditioned medium from these MM cells and MM-derived exosomes on cell viability and proliferation of the MC3T3 pre-osteoblast cell line and on their ability to produce alkaline phosphatase (ALP). We saw a decrease in viability and ALP activity when adding exosomes or conditioned medium of the 5TGM1 myeloma cells to the osteoblasts. RT-PCR analysis showed a decrease of osteogenic differentiation genes when osteoblasts were exposed to 5TGM1 exosomes, demonstrating a diminished capacity of osteoblastic differentiation. We next added the exosome secretion inhibitor GW4869 to the 5TGM1 cells, thereby reducing the number of exosomes in the conditioned medium. The negative effects of the 5TGM1 conditioned medium on osteoblasts could be overturned by reducing the exosome content therein. In vivo, we injected 5TGM1 exosomes intravenously in healthy mice for three weeks and examined the effects on osteolysis by microCT and TRAP staining. We saw an increase in osteolysis, comparable to the typical osteolytic lesions in tumor-bearing mice. Furthermore, when inhibiting the exosome secretion in vivo in 5TGM1 mice, we observed a significant reduction in tumor load. Through this study we can conclude that exosomes from MM cells can induce osteolytic lesions by inhibiting osteoblast proliferation and differentiation. These effects can be reversed by inhibiting the secretion of exosomes.